This complex, which still produces its own wine and olive oil, is a perfect base for exploring the Tuscany region. On top of a hill is a group of 7 beautifully restored holiday homes and apartments with magnificent views of the lower natural (fish) lake and the breathtaking Tuscan countryside. The apartments and holiday homes are spacious and nicely decorated and have access to a shared swimming pool. The lovely mountain region is called Mugello. This area is full of forest; hiking and cycling enthusiasts get to enjoy themselves completely here. 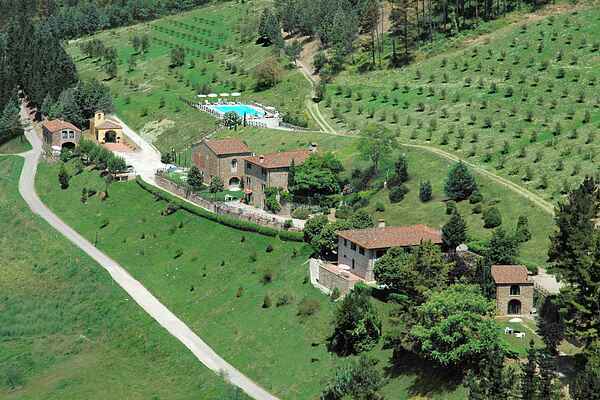 Pay a visit to Borgo San Lorenzo (15 km) just outside the ancient Franciscan monastery Bosco ai Frati. Also Scarperia (15 km), one of the most interesting historical centers, it worth a visit. A grocery store, post office, bank and restaurant are located in Dicomano (2 km). Visit the capital of Tuscany region: Florence (35 km). Sights in abundance: have coffee at the most charming squares, visit Ponte Vecchio, Duomo Santa Maria del Fiore, the magnificent palaces and the most important museums of the world. Of course, there is also great shopping in Florence.